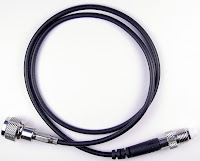 We have developed a short 20" coax jumper (Mini-UHF male to FME female) that connects a standard 20" RF external adapter to the Digital Antenna DA4000 amplifier. This eliminates the use of any additional adapters or coax assembles. The part number for this jumper is CX-699 and is included with the purchase of a DA4000 inline amplifer or the European model DA4000E. The RF antenna adapter cable for use with an external antenna for the HTC Mogul / XV6800 / PPC6800 / P4000 is the 359909.